Affordable Quality concrete contractor in Appleton, WI. Remove-repair-resurface-replace-install concrete driveway contractor, stamped concrete patio, foundation slabs/floors, poured concrete walls and decorative colored stamped concrete. Concrete contractor construction services for commercial, agricultural & residential projects. Contact us for concrete cost & prices on your project. Fill out our estimate request and we will contact you shortly. ​*Please include your contact information, project description, and SF or dimensions. Included in Appleton WI concrete estimates. Up to 4" of stone. Min of 4" premium 6 bag, 4000# concrete. One of the most Affordable Quality concrete contractors in Appleton Wisconsin! ​We do all projects of all sizes. We are able to install/remove/replace concrete driveways, aprons, patios, concrete garage floors, slabs, decorative colored stamped concrete, sidewalks, exposed aggregate, foundation walls, and can even do the final landscaping. Local - Appleton, WI concrete contractor that is State Licensed #1152496, Fully Insured & Family Owned. Looking for driveway, patio, foundation slab/floor, poured concrete walls, decorative colored stamped concrete contractors cost in Appleton, WI? Concrete driveway contractors cost near Appleton, WI. Looking to repair/replace/install a concrete driveway in Appleton, WI? Concrete driveways are a cost efficient way to go for your new or existing driveway. Is there existing blacktop, asphalt, or concrete driveway in the way? We remove old blacktop, asphalt and concrete driveways and install with a new paved concrete driveway. Removal of existing driveways can be dangerous and difficult but we have the proper equipment to remove and safely dispose of the old materials in an eco-friendly way. We are also able to remove the existing blacktop, asphalt or concrete that has been cracked, settled, or shifted and provide an affordable new concrete driveway! Decorative concrete - colored & stamped concrete contractors cost near Appleton, WI. 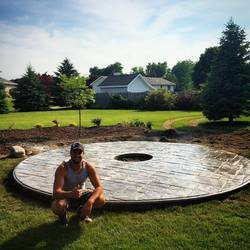 The cost of a stamped concrete contractor in Appleton, WI. Are you looking for a beautiful patio that will last? 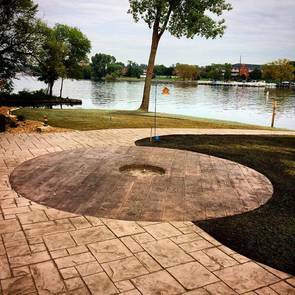 Take a look at our decorative stamped concrete patios in Appleton, WI. We can stamp and color concrete patios. We are one of Appleton, WI best decorative colored stamped concrete patio contractors. We have a wide range of colors and stamps to choose from and are able to customize any patio to your taste. After the concrete patio is colored, poured, stamped and cured; we will detail the stamped concrete patio and seal it with a decorative concrete sealer to bring out the true beauty of the stamped concrete. If you want something unique look to us and come with your ideas... we will make it happen! Concrete foundation slab/floor contractors cost near Appleton, WI. Concrete foundation slab/floor contractor. Concrete flooring in Appleton, WI is one of our specialties. If you are looking to have a new project started or would like to pour an interior concrete floor we can help. We can accommodate for concrete floors that are in a basement of an existing home, a new pour for home foundations, concrete foundations for a building or shop or even an exterior building like a barn or shed. Contact us if you would like a price on a concrete floor for your new home or building and we can get you started! Poured foundation footings & poured concrete walls contractors cost near Appleton, WI. Asphalt/blacktop & concrete driveway removal contractors cost in Appleton, WI. Don't delay contact us today! for pricing on your Appleton WI concrete project!